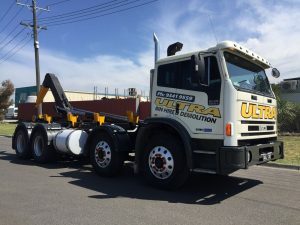 Searching for a company or a contractor who can take care of everything from bin hire in Hawthorn through to demolition, site clearing and preparation? Our team pride ourselves in offering services that are designed to save you time and money. Whether you just need to hire a skip bin or walk in bin, or you need a few of our services, you can trust our team to get the job done at the highest standard. If you are in the Hawthorn area and you need a small skip bin or a large walk-in bin, Ultra Bin Hire & Demolition can look after you. With bins available in a range of types and sizes to suit varying needs, we’re capable of providing bins for a variety of projects. With our ultra competitive pricing, we can cater to any budget. We make the process as easy as possible for you and dispose of the waste in a responsible manner. If you need more than just bin hire and need help also removing the rubbish, we can help. Our team of experts cam help with clearing rubbish from a residential property or a commercial site. We can collect everything from general waste to hard rubbish taking care of your rubbish so you don’t have to. If you have a residential or commercial project in the Hawthorn area, we are your demolition contractors to handle the job. With years of experience and ongoing training, we have the skills and resources to get the job done right. Bin Hire Melbourne – With a huge range of bins available for hire, we service Melbourne and surrounding areas. Demolition Services Melbourne – We can take on projects of all sizes. Whether it’s a large demolition project or a partial demolition job, our experienced and qualified team are here for you. Rubbish Removal – In addition to bin hire, we go one step further and offer a service that will also remove the rubbish for you. Site Clean Ups – Environmentally responsible site clean ups for before, during or after construction.